Carol is hosting Garden Bloggers' Bloom Day again but of course the big challenge today is finding blooms in the dead of winter. Normally that wouldn't be so hard for me. There's always a few here and there. But with that "Artic Blast" so many of us in the U.S. experienced, blooms are now hard to come by. In fact, impossible. But wait. Is that the shadow of bloom I see?? Yes, one of the few plants I have indoors is an Apple Blossom Amaryllis, bought for a gift exchange at our Master Gardeners club last month but won back by me. Yay! I was hoping this would be entirely open by Bloom Day but no matter. It's still fun to watch and document the transformation. Plants are amazing, aren't they? UPDATE: Turns out this isn't an Apple Blossom amaryllis, although that's what the box said. I'm not sure which variety it is now. Tomorrow Pam is hosting Foliage Follow-up, which I plan to post about. A couple days ago I took some photos of what did and did not make it through the Artic Blast, just for my own historical benefit. So I'll go ahead and post about that (not that anyone wants to see mushy plants!). Jean — I've had that Amaryllis and it is so lovely as is your shadow image! I've declared this the Year of the Amaryllis. So many of us had one or more for Christmas and beyond, and next fall everybody should buy two -- one to keep and one to share when it comes into bloom. Apple Blossoms is a fav. I know that 'Apple Blossom' has no ess on the end -- my fingers type independently of my mind! I wish I had an amaryllis about to open. I'm with Nell Jean on having this be The Year of the Amaryllis. And yours is one of the most stunningly-photographed I've ever seen. Beautifully done. 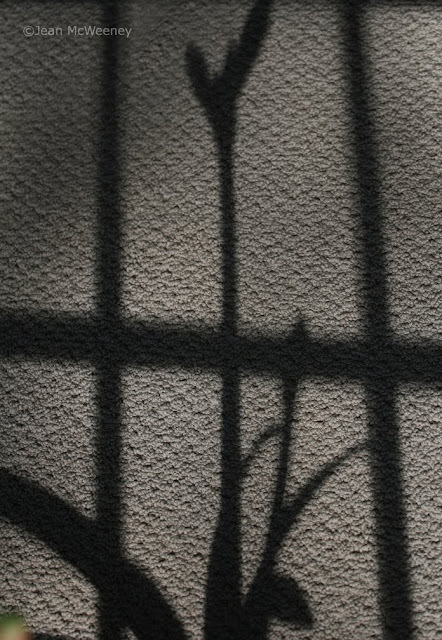 Cool idea to photograph the shadows; lovely bud photo. I'll be interested in seeing your pix. I'm not far from Pam/Digging and we're in a bit of cold shock here too. happy bloom day. 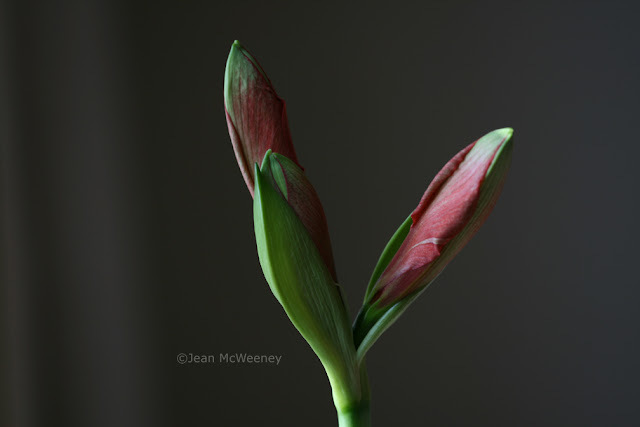 Your amaryllis is beautiful in bud but I'm sure it will be stunning when it opens. I'll be looking out for that bloom. It may not be blooming yet, but it is still lovely, Jean, and your photos are so artistic. I'm looking forward to seeing what did make it through your Arctic blast--it will be interesting to see what plants are true survivors. I like your silhouette shot of the Amaryllis. I think the official flower of this year's January Bloom Day is the Amaryllis. Gorgeous bloom.... I am glad we had this event because I was able to find your blog for the first time. Happy Bloom Day ... can't wait to see what you share next month. I shared a v-blog from my very green Greenhouse in Ohio. I hope you stop by and take a look! I love your silhouette and I too have an amaryllis about to.....I am going to try to post on foliage tomorrow. I should just do that post right now. I've got an amaryllis in bud also; another few days and I might have had a bloom for this Bloom Day. Thanks for the plug about Foliage Follow-Up. I look forward to seeing your post. Jean this is stunning!! Poetry! Well Done!! Gail, thanks. I'll shoot you an email w/the details on how I shot the photo. Jean, I photographed the damage around my gardens, too, as a reminder for myself in future winters. I was going to post them but, dang, one dead brown plant looks very much like another! Thanks everyone. I now think I've got a different variety than Apple Blossom, although that's what the package said. Dang big box purchases! Cindy - you're right about dead plants looking alike. I ended up not posting all the pics I took because of that! Your shadow photo is very creative. Wish my mind worked like yours. Nice. The shadow is almost as pretty as the plant itself. I have Appleblossom too but it has a way to go before blooming as I just brought it up from the cellar and repotted it last week. It's a real beauty! They sure are a great delight during these winter months that keep us stuck inside. You should see the Clivia today..7 blooms are open and it's gorgeous! I hope yours blooms again soon. Treat it as you would an Amaryllis...don't forget to begin feeding in the spring...then let it rest for a couple of months and hardly water. Also enjoyed your foliage post. Your plants sure had a tough time. It's so sad to lose them. I hope most come back.